We were honored to be apart of 3 incredible days with Moe Hair Gold USA this past week. We collaborated with well known, seasoned Hairstylists and Makeup artists to create looks showcasing all of Moe Hair products. 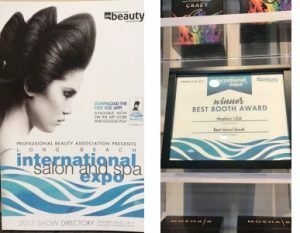 We have had the pleasure to work with Moe Hair Gold USA on several occasions and we always leave feeling inspired by him and his team. He really knows how to set the bar as a company. Not to mention it was their first time as an exhibitor and we Won the “Best of Booth Award”. Cheers to more adventures and awards in the industry!